We in New York intend to form our own country and we’re taking the other Blue States with us…. In case you aren’t aware that includes California, Hawaii, Oregon, Washington, Minnesota, Wisconsin, Michigan, Illinois and the rest of the Northeast. We get 85% of America’s entrepreneurs. You get Alabama. Since our aggregate divorce rate is 22% lower than the Christian Coalition’s, we get a bunch of happy families. You get a bunch of single moms. With the Blue States in hand we will have firm control of 80% of the country’s fresh water, more than 90% of the pineapple and lettuce, 92% of the nation’s fresh fruit, 95% of America’s quality wines (you can serve German wines), 90% of all cheese, 90 percent of the high-tech industry, most of the US low sulfur coal, all living redwoods, Sequoia’s and condors, all the Ivy and Seven Sister schools plus Harvard, Yale, Stanford, Cal Tech and MIT. We also get Hollywood and Yosemite, thank you. 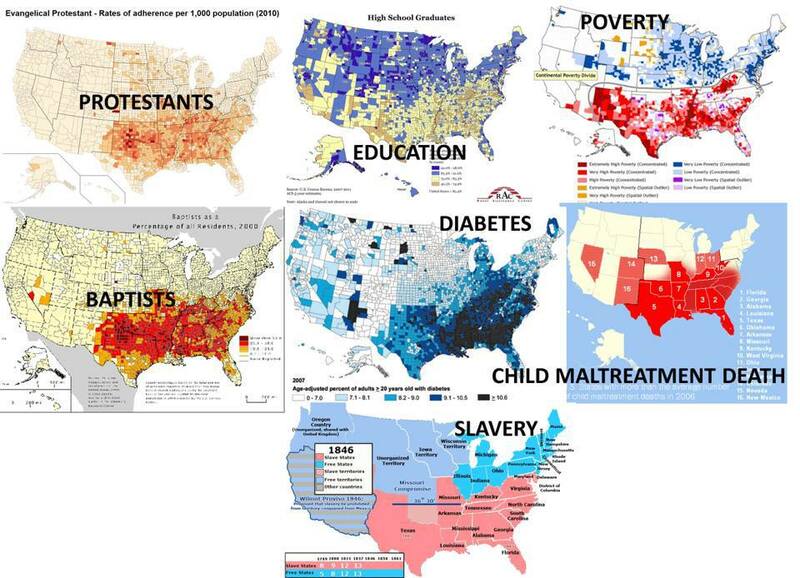 With the Red States you will have to cope with 88% of all obese Americans and their projected health care costs, 92% of all US mosquitoes, nearly 100% of the tornadoes, 90% of the hurricanes, 99% of all Southern Baptists, virtually 100% of all televangelist, Rush Limbaugh, Bob Jones University, Clemson and the University of Georgia. You also get the 38% of those in the Red states who believe Jonah was actually swallowed by a whale, 62% who believe life is sacred (unless we’re discussing the death penalty or gun laws), 44% who say that evolution is only a theory, 53% who believe that Saddam was involved in 9/11, and the 61% of you crazy bastards who believe you are people with higher morals than we lefties.